Irv Althouse and Jen Heffentrager have done it, yet again! Another fantastic U.S.K.A action packed card is on the horizon in less than a week on January 28th, returning to the Field House in Hamburg, PA. Between the title fight of PJ Sweda taking on Ben Pride for the distinguished U.S.K.A world title, the first pro female fight on a U.S.K.A card, as well as a seasoned veteran returning for his homecoming pro debut, the fans have all they can ask for! 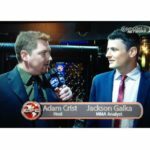 Tune in below as Jen Heffentrager goes one on one with MyMMANews’ own, Adam Crist ahead of this monumentous U.S.K.A Fight Night card which is assured to make Pennsylvania history!